Mr. McInerney concentrates in construction and government contracting matters. 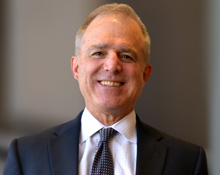 Mr. McInerney focuses primarily on contract preparation and negotiation, disputes, claims and litigation matters involving public and private construction contracts. He has represented general contractors, specialty subcontractors and sureties as plaintiff and defendant in state and federal court jury and bench trials. He has arbitrated matters before the American Arbitration Association, Judicial Arbitration Panels as well as private judges. He has extensive experience representing contractors on appeal of OSHA citations as well as prevailing wage issues before the U.S. Department of Labor and Department of Industrial Relations. He has appeared on behalf of his clients before state and local entities on various matters including bid protests and substitution hearings. Mr. McInerney has been involved in the drafting of a number of contractor association’s general contract and subcontract forms. Mr. McInerney is a member of the Engineering & Utility Contractors Association and the California Associated General Contractors Legal Advisory Committee. Mr. McInerney co-authored a yearly supplement to the book Architect & Engineering Liability: Claims Against Design Professionals.